There are guides on how to restock everywhere in Neopia, for shops such as Kauvara’s Magic, Chocolate Factory, Toy Shop, etc. But those shops are mainly based on speed, connection, and skill. However, there’s one place you can restock and still make a lot of profit – not requiring any of the essential items to be a successful restocker. I’ve been surprising many people lately because I’ve restocked so many Quadrapi and Weewoos from this little shop and I’ve gotten multiple neomails asking questions about where they restock and how often. All of this got me thinking, what better way to spend my time than write a guide about it? What place am I talking about you ask? Well, Little Nippers of course! This place is located on the shores of Krawk Island and sells many wonderful Krawk Island petpets. There’s a little twist on it, though; petpets restock for dubloons instead of neopoints. Of course, Little Nippers doesn’t make as much profit as other shops like Magic, but for a beginning restocker, the profit here adds up. I’ve been restocking here for about six months and believe me; I’ve seen a plethora of Quadrapi and Weewoos. Although there are other petpets in the shop, none of them give profit, so it’s best to stick with buying Quadrapi and Weewoos. You can easily buy the other petpets off the Shop Wizard and save Neopoints and time if you really wanted one. Best of all, both of these petpets restock at the top in basically the same spot, so there’s no need to scroll down. Another thing, you don’t need patience for restocking here at all. When I first started restocking here, I would sit for hours and hours and refresh. I found that didn’t work out too well and did nothing but waste my time. Now I just have Little Nippers bookmarked and randomly click when I can and I walk in on Quads and Weewoos all the time. So when you’re restocking here, refresh once in a while when you have nothing better to do. Well, first off, this petpet’s yellow and round appearance is pretty hard to miss. As stated before, it restocks at the top, usually in the first row, right corner. 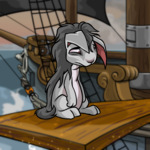 This cute little petpet can also give you an avatar. I can’t tell you exactly how, but your neopet will sure appreciate it if they can play with it for a few weeks. So why spend your hard earned neopoints and buy a Quadrapus at regular price when you can easily get one it for as little as 30k? And now, the Weewoo; the pride of Krawk Island’s little shop, sought by many, coveted by all, the icon of the Neopian Times; this little bird is an expensive little creature, but it’s adorable as pie! Weewoos restock as the first petpet on the page, but they’re not as noticeable as Quadrapi. But with a sharp eye you could easily score yourself this wonderful companion. There are some advantages and disadvantages of restocking in Little Nippers however. Personally, I like restocking there mainly because I think there are more benefits than drawbacks, but everyone has different opinions. This could be the shop for you, but it very well couldn’t be. 1)	Fewer people are in the shop because it doesn’t restock as often and many do not have the patience for it. 2)	It restocks for dubloons and not many people just happen to have enough dubloons in their inventory. 3)	No haggle – There’s just a popup asking you if you would like to buy, and you click OK.
4)	Not much speed or talent is required to be successful. 1)	You have to buy dubloons. 2)	The risk of bad random events that take your dubloons. 3)	Little Nippers doesn’t restock as much as other shops. Well, the maximum you should need in this shop is 165 dubloons. Because that’s the amount Weewoos stock for. The most difficult thing of all, restocking here, is buying the dubloons. Other than that, restocking here doesn’t take much practice at all. So easy a caveman can do it! (No offence to Tyrannians.) 100 dubloon coins used to be available through the Shop Wizard, but now they’re unbuyable and can be only found in the Trading Post. If you’re someone like me, who doesn’t have the patience to wait for someone to be online to buy 100 dubloon coins, then you should stick with buying 50 dubloon coins instead on the Shop Wizard. These are just my preferences, but there are hundreds of different combinations you could try to have the right amount to restock a Quadrapus or Weewoo. In my opinion, the best combination for dubloons is two 100 dubloon coins. That way, if a Quadrapus and a Weewoo restock at the same time, you’ll have enough for both. If you’re short on neopoints, having exactly 165 dubloons or restocking only Quadrapi might be easier for you. I remember when Tarla gave out 100 dubloon coins. Before I didn’t restock in Little Nippers, so I kind of missed out or I would have stocked up. The prices of the dubloons have gone up drastically now, so I have to spend quite a bit to have enough to restock in Little Nippers. I don’t like having many dubloons in my inventory, so if it’s possible, I usually go to the Dubloon-O-Matic to convert my dubloons. It requires a bit of math, but I suggest you do it to save yourself from a grab from the Pant Devil. Tip: I like to keep Pant Devil Attractors in my inventory, at least five, so the Pant Devil doesn’t grab my dubloons. They’re not expensive at all, and could save you when you come face to face. Of course, the little monsters of Neopia have snatched my dubloons once or twice, but the profit for restocking here is worth the cost. So this concludes my article; hopefully you enjoyed reading it as much as I enjoyed writing it. Just remember to stock up on dubloons, and go snag yourself a Weewoo! I wish you all the best of luck!